Whitianga is the main settlement of Mercury Bay, located on the east coast of the Coromandel Peninsula, New Zealand. The Beachside Oceans Resort Motel Apartments are perfectly located for you to enjoy the many activities Whitianga offers: swimming, diving, bush walking, scenic cruises, soaking in a hot pool at low tide, horse riding, fishing, kayaking, relaxed shopping, dining on local cuisine, golfing- experience the magic and relax in our unspoilt playground of paradise - a recreational haven just waiting for you. Accessible only on foot or by boat, famous Cathedral Cove is one of the “must visit” sites on the Coromandel Peninsula. The track begins at the northern end of Hahei. Cathedral Cove Marine Reserve, Te Whanganui- A-Hei, covers 9 square kilometres and is New Zealand’s sixth marine reserve. It is administered by the Department of Conservation. This site was chosen for a marine reserve because of the rich and varied habitats associated with the coastline and outlying islands. Reefs of hard rock, soft sediments, intricate caves and underwater arches provide homes for complex communities of plants, crustaceans, molluscs and fish. Sheltered from the worst of the southerly winds Te Whanganui-A-Hei gives visitors an opportunity to learn from and enjoy an unspoilt marine environment. Some volcanos develop huge underground reservoirs of superheated water. Over time, this water will escape to the surface — cooling on the way. There are two fissures at Hot Water Beach issuing water as hot as 64?C (147?F) at a rate as high as 15 litres/minute. This water contains large amounts of salt (NOT salt water), calcium, magnesium, potassium, fluorine, bromine and silica. There are other hot water springs nearby but the location of these two springs on the beach make them unique. The hot springs are only accessible at low tide, however more often than not two hours each side of low tide, will still provide you with an opportunity to dig your own spa. Spades are available for hire at a local store. 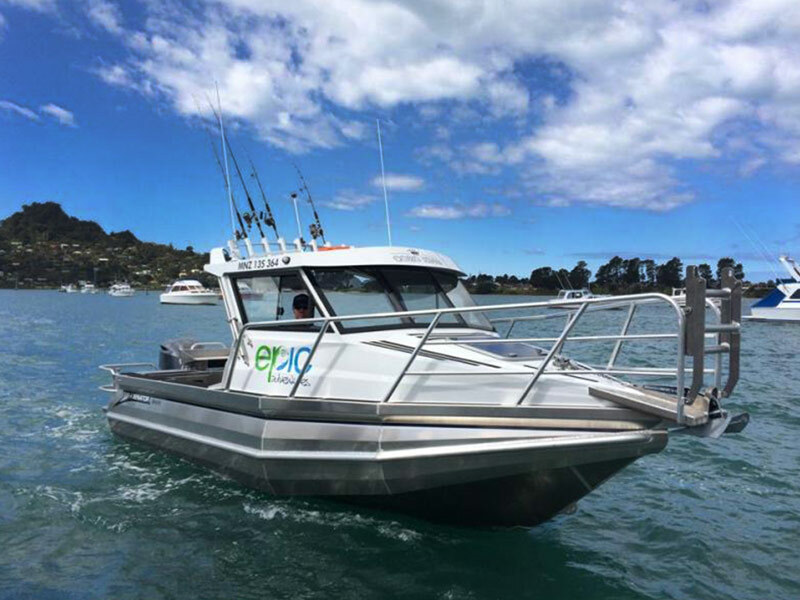 Epic is about exposing the best skippers from the best fishing locations in New Zealand, to the world. We're about a sense of pride and professionalism and an unmistakable passion for fishing adventures. Epic is synonymous with fishing sustainability and respect to the health of our fisheries. We're about a team dedicated to sharing some of the most enthralling fishing experiences on the planet, all backed up by the friendly service of a family run, NZ home brewed fishing charter company. You can be assured Epic will pull all stops to provide World-class fishing adventures. The Lost Spring is a thermal paradise located on New Zealand's picturesque Coromandel Peninsula. Relax in therapeutic mineral-rich thermal spring waters surrounded by gorgeous tropical and native gardens. Enjoy poolside service, or dine at our onsite Restaurant offering delicious Pacifica cuisine. Pamper yourself with massages and beauty treatments at The Lost Spring Day Spa in the treetops. A truly unique experience and a luxurious way to relax. For more great activity ideas visit the official tourism site for Whitianga and Mercury Bay, Coromandel Peninsula, NZ - http://www.whitianga.co.nz/. Coromandel Online is a portal full of useful information about the Coromandel region from Accommodation to Coromandel Maps, History, News and More.